In general, leather used in Hermes goods can be classified in three distinct categories: Leather extracted from calfhide (skin), lambhide, goathide, and exotic leather (from ostrich, alligator, crocodile). There are also other materials they use such as nylon, carbon fibre, canvas. I'll try my best to describe some of the popular leather in the first category, those derived from living beef (the baby as well) and mutton. This article is based on the information I've gathered in the internet, but mainly credited to many experts and Hermes lovers in the PurseForum. 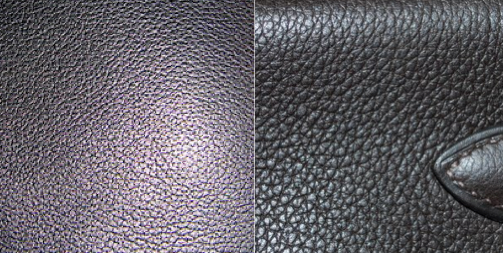 If you have any additional info on the leather characteristics, please do let me know. Made from lambskin. It is very soft and smooth, susceptible to scratches but ages well with slight patina and greying on the edges. Generally used in gloves, some small leather goods, and many vintage clutches. The leather has a smooth, a bit glossy appearance, and is resistant to scratches due to its oil absorbing ability. Fine scratches can be rubbed off with our fingers easily. Barenia also has a good water resisting characteristic, it can do well on rainy days. The leather will develop natural patina as it ages. 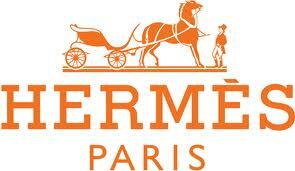 In the old days, Hermes use Barenia leather for its saddle. The oldest Hermes leather that has been around since like the beginning of time. Has a smooth appearance with a glossy finish. It gets scratches easily, but the marks will eventually blend in and become a glossy mirror-like patina. The leather is very susceptible to water stain, so we have to be extremely careful with sweats or rainy days. May form blisters if waterdrops are not wiped off. From buffalo hide. Possess fine grain with a smooth texture, looks somewhat shiny under the light. The leather can resist scratch well and age beautifully. Generally used in small leather accessories. From water buffalo. Medium sized grain with a flatter appearance. The leather can stand well against water droplets, and someone said she sees no visible stain or spot on her bag after carrying it on rainy days. Buffalo leather has an interesting characteristic of absorbing the dye the most in the centre of the grain, so it looks darker. A matte version of boxcalf. More resistant to scratches than boxcalf, but has greater tendency to blister in contact with water. The leather finish gives it an almost plastic appearance. The leather comes from baby bull and has become a classic since the 80s. The grain is bigger and flatter than Togo. It is heavy so Clemence makes for slouchiest bags. Poor water resistance, contact with water may give permanent blisters. There is a high possibility that older bags will develop cracks along the edges, but the leather can be refurbished to appear in mint condition if you bring it to the store. It has a very similar look and properties to epsom: Lightweight, embossed grain, easy to clean. But Courchevel gives a more glossy appearance and the top part of the grain is darker. We can see this leather on small leather accessories. This is an embossed leather, meaning that the pattern is imprinted into the leather so the grain visible to our eyes is not the natural grain. As a result, it is more rigid and structured. It's easier to clean stains on this type of leather. Relatively light-weight compared to other leather. Has a similar grain appearance to Boxcalf, but with a softer texture and feels smoother. Can be refurbished in the store to look as good as new. The embossed version of Evercalf, but it has a softer feel relative to normal embossed leather. The grain is really fine, so it is more prone to scratches. From adult cow hide. Possess a wider and flatter grain than Togo or Clemence. Bag with Fjord leather is more immune to water droplets. Some people say it's heavy. Gulliver was discontinued in 1999 and brought back again as Swift in 2005. It is a soft leather with fine grain. Can get scratches easier than Clemence and Togo, but fine scratches (not a gash!) can be easily rubbed off with our fingers. The grain seems to reflect light in such a way that the leather looks luminous, and it's a great dye absorbant so bright colours look more radiant in this leather type. Extracted from baby calf (a veau). It is a soft leather that will produce veining as it ages, but we can choose to have it veined or not in the Hermes store. Resists scratches well and can be refurbished to almost as good as new. It isn't as soft as Clemence, but has a finer and slightly more pronounced grain. Some find bags with this leather type heavy. One of Hermes classics, the leather is extracted from a mature cow. It is an untreated leather which is coloured with vegetable dyes. It has a fine grain with smooth finish. Since the leather is untreated, it will naturally develop patina over time and is prone to stains. Have to be extremely careful with waterdrops as it's very susceptible to spotting. When maintained properly, the leather will age with beautiful patina and can last several decades. The super glossy version of Boxcalf. Seen in small leather accessories. As the name implies, it's made from a veau. The most notable characteristic of this leather type is its deep veining. Has a small grain with a soft and smooth finish. The fine grain, however, makes it more prone to scratches. Generally found in small leather accessories. Sourced from PurseForum. Images from various sources.